As we’ve said, our recent swing to plutocracy in our leading economies since the early 1980s is just one phase of a natural Plutocratic-Democratic pendulum. It eventually will reach a maximum and start to reverse. An inevitable swing back toward democracy, with a greatly improved social contract for the average citizen, seems predictably in our future, as wealth and technical productivity grow. When this swingback will occur, and how strongly it occurs in different countries, is of course much harder to predict. That’s in the realm of our free individual choice. But I do generally expect we’ll increasingly realize that “taxing the machines”, a higher tax on profit-making enterprises (which all employ increasingly advanced technology), will be the fairest and simplest way to redistribute the accelerating wealth that our increasingly intelligent machines will create. We will call it taxing the rich, or taxing corporations, but what we are really taxing, whatever we call it, is our increasingly productive and intelligent machines. They’re the entities most responsible for wealth creation in modern economies. As new school economists like Paul Romer have demonstrated, the real wealth of our society in an information age is not being created by Wall Street (finance), Government Street, or even Main Street (consumption) but by Engineering Street — the smartness and capabilities of our machines. Today, Engineering Street is systematically neglected by politicians, media, and society. But as wealth continues to accelerate at the top, future politicians and voters, will eventually understand that our machines create the vast majority of wealth, and we’ll start prioritizing science and technology, innovation, and entrepreneurship education, policy, and funding at the level they deserve. I have heard that Michael Faraday, one of the inventors of electricity and the electric motor, made the claim that his new machines would be so productive in the future that that we should tax them, as independent generators of wealth. If true, this is an excellent example of Beginners Foresight, the deep insights into the nature of the future that often come, like beginner’s luck, the first time any new technology or system condition emerges in society. Many other examples of such foresight exist. In addition to a political future where advanced democracies are increasingly “taxing the machines” to support an expanding social safety net, including a Basic Income, books like Alperovitz’s provide actionable road maps back to greater economic democracy in the US. As easily overwhelmed and mass media manipulated early 21st century voters we may not see these road maps yet, but in our increasingly evidence-based, digitally empowered, and agent-assisted future, we will. To see how this will occur, let’s step back a bit and look at public-private interactions in modern democracies. As students of political economy know, all our more enlightened capitalist democracies maintain healthy two-tier governance systems where basic services and benefits in several industries are publicly funded and run (education, health care, mass transit, etc.) and private firms are free to compete to offer supplemental insurance and services beyond the basics. This public-private line can and should be shifted around on a regular basis, as the evidence dictates. In industries that most Americans consider today to be best handled by private enterprise, Alperovitz documents many cost-efficient and equitable state-owned and community-owned banks, insurers, health care systems, energy producers, broadcasters, telecommunications firms, and the like. Over the last two centuries, communities, regions, and states have periodically pooled their resources to create such entities (public benefit corporations, charitable trusts, co-ops, credit unions, nonprofits, etc.). Many such firms have demonstrated far better records of supporting jobs, wages, and communities, creating broad economic benefits and equity, than their for-profit alternatives, which naturally strive to concentrate their benefits, equity, and power wherever they can. Most Americans today are only poorly aware of these examples, but our increasingly values-customized digital media and intelligent software agents will make us much aware of them, and of our political choices and powers, in coming years. One person, one vote, with accelerating digital intelligence for individuals, eventually means a much more democratic state. We’re also going to redesign our markets to make them fairer. Nobel prize-winning economist Alvin Roth discusses how we can make markets fairer in Who Gets What—and Why (2015). He helped redesign the kidney transplant market to make it better for transplant recipients, donors, and surgeons. He discusses how the right algorithms and rules make all participants measurably happier with outcomes, and why certain markets, as for CDOs, are moral hazards without proper oversight, and others like organ trading, are social negatives in net effect regardless of structure. Synergy scholar Peter Corning makes the same arguments in his excellent book The Fair Society: The Science of Human Nature and the Pursuit of Social Justice (2011). Let’s make it clear that authors like Alperovitz are advocating any kind of socialism, which is the elimination of private property and profit. Instead, they are taking about smarter regulation and taxation (social redistribution) of that property and profit. See Ben Wattenberg’s film Heaven on Earth: The Rise and Fall of Socialism (2005) for a great history of socialism, a deeply innovation-killing and ultimately inhumane political idea. The fall of the Soviet Union in 1991 and its reversion to capitalism, after seventy four years of coercive socialism, beginning with the Communist Revolution in 1917, and the far more rapid conversion of Chinese communism (1949-1978, or just 29 years) back to capitalism, shows the dangerous utopianism of socialist models. Even the Israeli kibbutzim, the most voluntary example of socialism yet produced, mostly reverted back to capitalism after two decades. Socialism it turns out, is incompatible with human nature. 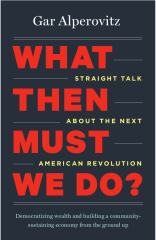 The questions folks like Alperovitz, Roth, and Corning ask us to address is how to best mix social programs and capitalism in a technologically advanced democratic state, while taking into account the known biases and tendencies of human nature. We can choose any kind of algorithms and markets we want. How do we form the best ones, ones that will augment our collective innovation, intelligence, interdependence, immunity, and sustainability? How do we empower citizens and leaders to form social enterprises as competitors to private ones, when markets aren’t working to our satisfaction? How do we hold both social and private enterprise more accountable to public benefit, or risk losing their public charters? A free and fair market must be able to employ all types of economic entities that have a history of providing social benefit. Alperovitz thinks a new swing to accountable social enterprise will emerge as communities increasingly see they will be better served, case by case, by creating their own local and regional public systems as competitors to private ones, and will increasingly develop the collective intelligence and financial power to fight for such reforms. He notes Vermont’s publicly-funded health care reform initiative, which may take the high cost of health care benefits provision off the backs of individuals and businesses in the state by 2017. He also highlights the state-owned Bank of North Dakota, which greatly helps local businesses and farms to stay around, and returns $300M a year in revenues annually to North Dakotans. Such firms are not accountable to increased financial profit to shareholders as their primary performance yardstick. They can operate with triple bottom line accounting, and take a more broadly foresighted perspective on their public benefit. Such firms of course have their own problems. They tend to be less innovative and risk-taking, for example. But with appropriate governance, they may be measurably more efficient than for-profit firms at providing benefit in basic public services and in technologically mature industries. I think the accelerating digital empowerment and software-aided foresight that average citizens have available to them in the next generation will allow us as consumers and voters to steer toward options that make sense for the many, rather than the few. We’ll choose to engage in publicly-funded, local, and collective activities and public-private partnerships when they make sense, and in private enterprises, when they make sense. Today in the US, 10% of our prisons and most of our military logistics are now privately run. We always want to be running some of these kinds of experiments, as each type of organization has advantages in very specific contexts. But in a data-driven future, we’ll see that in most contexts, private prisons and basic military logistics operations have worse outcomes, and cost society far more over time, than accountable public organizations doing the same thing. The key word here of course is accountable. Any organization, public or private, can fall away from transparency and accountability. It’s our job as citizens to find out when that occurs and bring wayward organizations back into the fold. The increasingly data-driven, evidence-based world that digital technologies are now creating will tell us when and where each of these kinds of entities are likely to provide the most public benefit. Digital empowerment tools will increasingly aid the voting 99% in ways that the 1% can no longer effectively control. If this happens, a swingback to a socially more redistributive and broadly participatory capitalism will occur even in the US, which is now one of the most income and asset unequal industrialized countries. Consider the following scenario for that transition. As I’ve written since 2003, after 2020 I expect US and other developed-world citizens to have access to increasingly powerful personal software agents, or “sims”. These Personal Sims will have learned crude statistical models of our history, goals, and values, and will be our own personal artificial intelligences. People will use lots of sims that have models of their interests, values, and personality, to varying degrees. But I’m betting that for personal empowerment, many of us will use just a few, or even one, most of the time, as our primary interface to the world, and as a manager of all our other sims. That sim will know us, and be us, the best. Just as we’re all staring at our little screens today, we’ll soon all be talking about how our sim said this, or sim did that. It’s going to grow into a digital version of us. Throughout our lives, our sim will be the fastest-improving version of us in the world, growing twice as capable every two years, just like Moore’s law. Anyone who’s ever had a baby, or watched one grow up, will see that part of themselves as being like a baby again. A baby that never stops growing. It will be a very optimistic and empowering way to re-understand ourselves, and I’m excited to tell that story. Our sims will advise us, using natural language conversation, on what to watch, read, who to meet, what to buy, how to vote, and what political initiatives to back. Early examples that exist today are software platforms like Google Now, Siri, Cortana, and human emulation agents used for call center and chat automation, website, and health car assistance, like those offered by Next IT (picture right), where I am an advisor. Tomorrow’s personal agents, as weak artificial intelligences, will perform ongoing semantic analysis on everything we say, write, and read. They’ll be able to use the public preferences and recommendations of other people we know and respect to guide our agent in offering its recommendations (think of Amazon’s or Netflix’s collaborative filtering recommendation engines). The better the web’s semantic maps of our activity and interests get, the better our agents will be able to help us connect and collaborate with others who share our interests, and lobby for those interests via our purchases, donations, and votes. Since the vast majority of us value good jobs, sustainable environments, and real wage growth, and since democracies are one vote per person, our coming agents will increasingly become “lobby sims”, able to help us guide our spending, action, and votes toward futures that we care about. There will be global cultural diversity of course, but I think most of these social and economic futures will look increasingly like some variation of the Nordic model of capitalist social democracy. Philosopher-scientist Jonas Salk, in The Survival of the Wisest (1973), argued, in the tradition of Plato and Confucius, that our democracies would have to learn to select wise leaders, those with a deep understanding of the world, a record of good judgment, transparent values, and a well-articulated vision of progress, in order to to create wiser, more adaptive societies. I agree with this view, and in a world of sims, I can see how we could finally start moving toward evidence-based and wisdom-based politics, after centuries of politics being primarily a power- and wealth-based dynamic. But even if we don’t, I think our own sims will increasingly go there themselves. They’ll become wiser, at far more rapid rates than we will. Fortunately, most voters already want a future with strong social safety nets, and much more political and economic equality than they have today. I would hope most voters also realize the importance of delivering those social safety nets in a fiscally responsible way. If they don’t, economic consequences will teach them that value eventually. As we’ll see now, the Nordic democracies, including Norway, Sweden, Denmark, Finland, Iceland, as well as Switzerland throughout the 20th century, and liberal democratic Germany since the 1950s, have long offered that kind of future, as innovation leaders in various trends in economic democratic governance including countercyclical economic policies, fiscal conservatism, means-tested social assistance, corporate transparency and reform, universal health care, luxury taxes, free university education, strong mental health services, prisoner rehabilitation, resource sustainability, and other initiatives. There are several embattled democracies, advanced democracies facing particularly strong social or economic stresses, countries that include Israel, Taiwan, Singapore, and post-apartheid South Africa, that are social foresight leaders. Such countries often lead the world in per-capita spending on formal capacities in planning and foresight. Some of these countries are also personal empowerment leaders as well, in various specific ways. But prioritizing governmental foresight is not the same thing as empowering your citizens, and several of these countries have yet to become global leaders in both domains. It is the Nordic democracies, Switzerland and Germany that are most conspicuously both personal empowerment and social foresight leaders today in the world. Their model of government is sometimes called Nordic capitalism or social corporatism. Global foresighters can learn deeply from these countries, and I believe many Nordic innovations will inevitably spread to less socially advanced but more economically and militarily dominant countries like the USA. Let’s look now at three specific ways that these countries outshine all the others, and what the rest of the world can learn from them. As political scientists Inglehart and Welzel (2005) nearly fifty years of global surveys show at right, all governments seem to be following a short-term evolutionary but long-term developmental path toward the upper right of this graph, where the Nordic democracies reside. 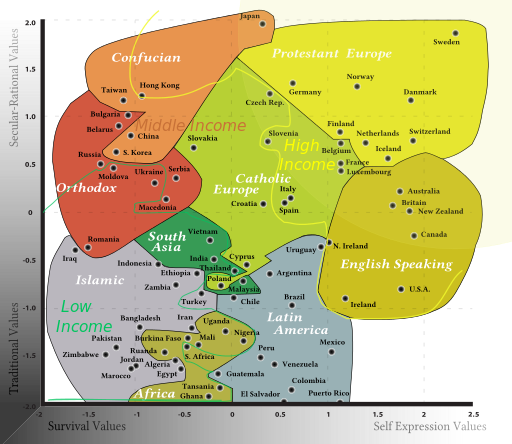 The maximization of the three variables represented on this graph, self-expression values, secular-rational values, and median income, might be called Inglehart’s Triad. These variables are a few key ways these leading countries are measurably, objectively more developed than countries like the USA, at present. They lead these particular aspects of the future. For an example of an obvious probable future, because Norway’s leaders were forward thinking, being responsible with their blessing of great oil resources, Norway now manages the largest sovereign wealth fund in the world, US $824B in 2016, ahead of Saudi Arabia, the UAE, and China,. They saved for a rainy day, while other democracies continue to spend their marginal wealth as fast or even faster than they generate it. Americans are both amazed and suspicious when they hear that Norway gives anyone who lives in their country free education and health care, whether they are citizens or not. They can’t believe Norwegians let many criminals out of prisons on weekends, years in advance of their sentences ending, to test if they can reintegrate with society. Norway is building out the world’s first hydrogen fueling infrastructure, allowing both hydrogen-powered and electric-powered transportation and energy to displace fossil fuels. We could go on, but these examples are enough to make the point. Nordic democracies have a long history of more responsible fiscal management, planning, and social foresight and this has allowed them all offer great freedoms and social safety nets to their societies, and an education system that keeps voters evidence-based rather than belief- or ideology-driven. Even countries without lots of oil, like Finland, deliver great health, educational, and social benefits to their citizens, while still remaining economically and technically competitive.We can see that while the US enjoys the privilege of being the world’s financial and military leader, it is measurably much less evidence-based and much more ideological in its political process than many other democracies. American’s feel and believe, much more than they think, plan, or collect evidence before their decisions. Because they are the world’s financial and military leaders, Americans are also unlikely to change the low level of probability foresight in their culture anytime soon. Americans don’t believe that certain aspects of the social future are inevitable. Everything is possible here. Or at least those are the stories we tell each other. But the reality is there are both possible and probable futures ahead. This isn’t to imply that any of these countries are leaders in all areas. For example, in respect to personal rights, several Nordic countries had discriminatory eugenics policies lasting even into the 1970s, and Germany didn’t approve a national minimum wage until 2014. But it is nevertheless true that many Nordic model social and economic innovations have inevitably emerged in the US and other countries a bit later, as we gain either sufficient wealth or sufficient civic maturity. For example, Sweden’s early abandonment of the Gold Standard in 1931, aggressive deficit spending, and extensive public works programs during the early years of the Great Depression (1930-1933), made them the first industrialized nation to recover from the Great Depression, which they did by 1934. Their recovery policies were so successful they were then imitated by the US, unlike the UK which stuck with capitalist “belt-tightening” rather than social aid. In particular, the Stockholm school of economics greatly influenced John Maynard eynes and his countercyclical economic model, and President Franklin D. Roosevelt adopted aspects of Swedish countercyclical model in the US with the Works Progress Administration (1935) and other New Deal (1933-1938) policies. In 1936, Roosevelt even established a formal commission to study Sweden’s “Middle Way” between socialism and unregulated capitalism. With regard to social policy, Roosevelt realized Sweden was leading the future, in that way, at that time. Fortunately, as the twin forces of technical productivity and technological unemployment continue to accelerate in the US, due primarily to exponential advances in CCN technologies (Computing, Communication, and Nanotechnologies), as we will see in Chapter 2, it is an easy social prediction that Americans will increasingly demand the redistribution of much more of that wealth back to its citizens, in the form of rising health, education, and other social benefits, including a basic income guarantee, moving us much closer to the Nordic model. If you want more on the long history of research and experiments on basic income, Karl Widerquist has been writing on this topic since the 1990s, and his perspective is deeply nuanced and evidence-based. His edited volume, Basic Income: An Anthology of Contemporary Research, 2013, is a leading academic work on the topic. What’s more, the more powerful technical productivity gets, the less worried the average voter will be about regulating economies and corporations in ways that slow marginal innovation. Every year forward since Future Shock was written in the 1970’s, more people are finding themselves overwhelmed by the pace of change and are now looking for ways to tame it. Thus I find it an easy prediction that ensuring that technological benefits are widely and fairly distributed will increasingly be the dominant social and political theme of the 21st century, and the Nordic approach, in general, will be increasingly attractive. But whether or not that new wealth empowers American citizens and gives them incentives to get educated and entrepreneurial as in most of the Nordic democracies, or makes their citizens deskilled, passive and dependent on foreign labor, as we’ve seen in the far-too-generous welfare systems of oil-rich countries like Saudi Arabia since 1950 (unfortunately), will depend entirely on the specific social policies of the countries doing the redistribution. Government benefits don’t have to disincentivize people. When Canada gave out a basic income in its Mincome experiment in the 1970s, education and childrearing both increased. One of the largest US social benefits yet, the G.I. Bill, was responsible for getting eight million Americans educated and trained for postwar America’s industrial advances. So people don’t have to abuse government-provided wealth and freedoms. Whether they do or not depends on their social environment and their expectations for the future. It is exciting for futurists and foresighters think of all the social changes that will be coming to our democracies in coming years, and very instructive to realize that, in many areas, Nordic democracies are leading the way. For an example of recent work from the Digital Empowerment school of foresight see Larry Lessig’s Republic, Lost (2011), and his crowdfunded SuperPac Mayday.us, which proposes campaign finance reform as a root strategy to check further growth of US corporatism. This issue may be addressed legally in 2017, as Lessig hopes, or we may well need to wait until the 2020s, when US voters have access to advanced personal software agents, helping us with crowd collaborations, and giving us all access to evidence on the centrality of this issue to corruption and democracy, before US citizens are willing to pass fundamental reforms. Agent-assisted future citizens may then see the value of tackling political reforms “worst things first”, using both digitally-coordinated civil actions and initiative politics, with fair representation being one of the “worst” issues needing reform. For example, we’ll see the value of ranked choice voting so that multiple political parties can emerge, then we’ll see the value of constitutional reform to create more parliamentary and representative democracies. Exploring the probable, possible, and preferable futures of sims (personal agents) in the 2020s and beyond is the subject of my next book. When I started talking and writing about these agents, as in this article in 2003, I called sims “digital twins”, a phrase that highlights their software nature, and the idea that the best ones will have detailed models of our past conversations, values, and personality making them so predictive that they will be able to whisper in our ear, completing our sentences for us when we have a “tip of the tongue” experience, just like two human twins who grow up together. They’ll also be able regularly quiz us all all the things we’ve learned that we don’t want to forget. So they’ll be a lot like our software twin. But some folks prefer the butler or secretary or agent metaphor instead, and think twin is a creepy word, true though it may be. Realizing that STEM compression will require us to come up with a faster and simpler phrase, I shortened it to “digitwins” and “cybertwins” for a few years. Early this year I realized the word sim, short for simulation, is sufficient. Author Robin Hansen prefers “Ems”, short for emulation. Facebook’s new smart agent, M, may be tip to that view. But I think sim is the best word to describe these systems. It is nearly as short as Em, and a much better known word than emulation. It reminds us of The Sims games, which are great examples of simple agents. So personal sim, or just sim is I think the best word for the smart personal software agents that many of us will be using and increasingly relying on in coming years. We’ll see if it sticks. Whatever we call them, I think sims, and the biologically-inspired machine intelligence that makes them work, will be the single most useful and socially important software invention humanity will see in the next fifty years, by far. Sims are how we’ll keep our increasingly technological society manageable to us, and our democracies focused on human concerns. Step by step, purchase by purchase, initiative by initiative, tomorrow’s digitally empowered voters seem likely to move us back to a more equitable world. I don’t think we’ll ever see the reemergence of socialism, thank goodness, but with increasingly useful personal sims, I can now see how we will create far more representative and productive social democracies, in the exciting and abundant years ahead.